Goosen i will like to here them. 1SSB & School of Armour 1979 - 1980. Colin Fibiger,Reinar Dressler and Louis Blume, I was your Lieutenant in 1980 when we were at Katima Mulilo and on the trip to Messina/Zim. 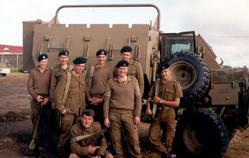 '67 till '76 NMR shooting team under Maj Dave Hopkins and A Sqn Troop Leader under Capt Dave Mack. NMR converted to Centurions in '75. With A Sqn to Oshivelo in Nov '76 then to Ruacana. 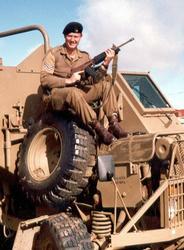 '77 Jan redeployed to 2 Locating Regiment at Ruacana Airport. Piper (2Lt.) in NMR , CTH and CFA till 2016. Johan Roos (bynaam was Rosie). John Swiegelaar, fantasties om jou kommentaar te sien. Ons altwee was destyds in A-Eskadron by 2 SDB. Ek was een vd radio-operateurs op Kaptein Von Mollendorf se Ratel. Die ander radio-operateur was Grobler. Ons het ook in opskamer gewerk, spesifiek by 10 Pantser in Oshakati onder Majoor Rodgers. Bring baie herinneringe terug! National service Jan 1984 to December 1985. A Squadron. Captain Von Mollendorf was our commander. Border duty at Oshakati and Ruacana. 1SSB 1979-1980. Corporal. Fellow crew Reinar Dressler and Louis Blume. among other camps round RSA. Any contact will be appreciated. pictures of my dads brother. Meer mense moet vertel word van hierdie webwerf sodat soveel moontlik kan vertel waar hul in die weermag was en van hul wederervaringe. Ook meer fotos waar moontlik. Kom manne. versprei die woord! Terloops. wsnneer verskyn die nuusbrief? Laat hoor bietjie van julle wat 1997 by die pantserskool was olv. van WO Peschell, Gustav Brink,Kpl Cloete en Litsoane hulle. Ek sal die waardeer. 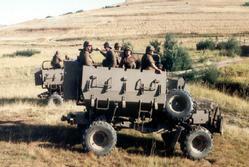 Manne wat saam my in A Eskadron was by 2 SDB in 1984/1985 moet asb fotos plaas as hul het. Ekself het ongelukkig nie fotos van daai tyd nie. Baie dankie! Served at SSB from Oct 1962; Still serving as Hon Col of UMR. Proud to be part of the Armor history. All the best with this effort. I am a member of the Armour Association, and will gladly assist with contributions to this website. Please let me know how I can assist? Olifant tenk kursus gedoen het. mid 1977 - Corporal at C Squad. National Service 1979 - 1980. Basics School of Armour, 1 SSB B-Squadron for the rest. - Border duty Apr.-Aug. 1980 at Katima. 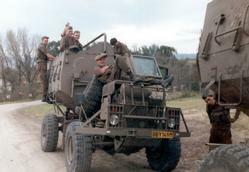 Eland armoured car with Leon Blume and Colin Fibiger. Remember corporal Peel, Lieutenant "old blue eyes" (forgot his name) and Lieutenant Odendaal (a lawyer). Where are they today? We are growing old. We live in a strange world today. Did basics at SOA during 1996. Best units that I ever served. Attending the open day last year brought some good memories. 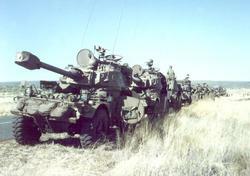 and 2 SSB Zeerust 1976.
pusher i always missed all the fun ! Any 38field members from 1979.
looking at the images it bring back a lot of emotions and longing. 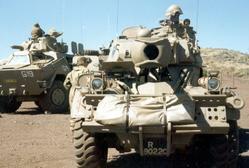 I attended School of Armour in 1971 and completed my year at Rooikop, Walvisbaai. 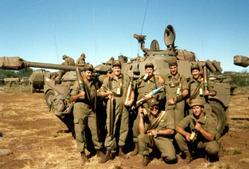 After that I served in Regiment Windhoek (with quite a number of border duties) until I left in 1984. The website is brilliant! Thank you. May 2000. OC from1993 to 2000. Hon Col from 2000 to 2013. 2SSB 87 - 89 F- Squadron. Excellent website that embodies what our beloved Corps is about. CF NMR 1975 to 1988.
greatness that is the Mill. Awesome site. Very impressed . Left 1LHR 1982 as a Lieutenant. Ruacana Airfield for Ops Protea. 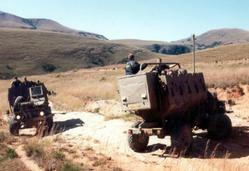 2SSB Zeerust, 1990/91, C Squad, Troop 1, Rooikat driver.